What better day to get this mess revved up again than a snow day? Looking back at the start of this blog, the hiatus wasn't necessarily a result of my other blog as much as it was a result of my other blog in combination with being back at work for a new school year. Working in education, it's very easy to find time during two months off each summer to work on things like a nonsensical blog such as this one. Then comes August...and reality. I'm home today and I'll likely be home tomorrow as well compliments of the ice and snow on the ground already and the expected 12-16 inches of snow expected to dump on us tonight. So here is my top five list of things I will do with my snow days. 1. Play in the snow. As a kid, this was a no-brainer -- when it snows, you go outside and sling the stuff around. You build forts and hit your friends in the face with snowballs. Now that I have kids of my own, this snow-day priority has returned to the number one spot (back again....Luda!). Right now we're sitting back and watching it fall but at this time tomorrow, I have a date with a three-year-old, the backyard, and an orange plastic sled. 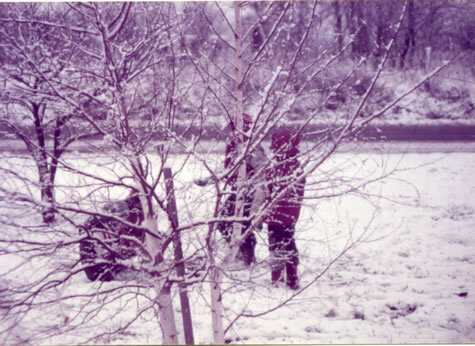 Below is a shot of me and a few friends from the old neighborhood taking advantage of a fresh snow in December of 1983. 2. Do stuff I don't normally have time to do. Translation? Play Atari while the kids are taking a nap. This afternoon's success was beating my previous "record-setting" score on Frogger (record-setting but unimpressive). Too bad the video camera wasn't running. I did sink to a near all-time low today by downloading a Lady Gaga song. Not for me, though. I swear. My daughter loves Bad Romance. Seriously. SERIOUSLY!! IT'S NOT FOR ME! "I just bought 400 Hot Pockets, a handle of Captain and case of toilet paper... Let it snow!" "This snow storm has received more hype than Inception and Slumdog Millionaire combined." "My kids have discovered the joys of She-Ra. So fun." "Sitting down to watch Star Wars with the whole family. Life is good." "I think I should go move my car away from the tree just in case it decides to fall." "I may need to start drinking now so when my trees start being destroyed by the ice and wind, I will be incoherent." 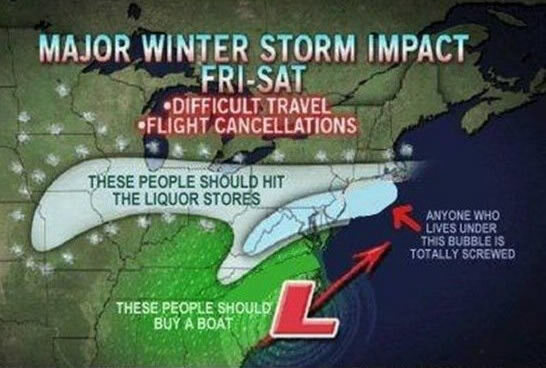 Luckily I fall in the range of folks headed to the liquor store and not those looking for a boat. Funny thing is, I stopped at the grocery store last night and had to laugh when everyone around me was buying milk and bread and I was holding a bottle of whiskey and a bottle of wine. 5. Look forward to summer. Hot days. Cold drinks. Cubs baseball. Summer vacation.